Step 2 Remove the oysters and mushrooms from the water and transfer to a bowl. Reserve one-fourth cup of the oyster water; be careful not to get any of the grit. Toss the oysters and mushrooms with a pinch of salt, a pinch of sugar and half a teaspoon of oil. Transfer the mixture to a steamer basket in a single layer. Steam until tender, about 20 minutes. When they're cool enough to handle, squeeze the water out of the mushrooms and finely dice them. Chop the oysters in quarter-inch dice. Set aside. Step 3In a small bowl, mix together the lean pork, one-half teaspoon rice wine, 1 teaspoon cornstarch and 1 teaspoon soy sauce. In another small bowl, combine the reserved oyster water with 1 teaspoon cornstarch and 1 teaspoon soy sauce. Step 5Add 2 tablespoons of the oil, the ginger and the green onions, stir-frying about 30 seconds. Add the carrots, sauteing until crisp-tender, about 2 minutes. Stir in the marinated pork. When the pork is browned, add the snow peas, cooking 1 to 2 minutes. Turn up the heat to high and add the oysters, mushrooms, water chestnuts, barbecued pork and preserved vegetable. Mix well and heat through. Stir in the oyster sauce, then add the remaining half teaspoon rice wine. Make a well in the center and pour in the cornstarch mixture, stirring and cooking till thickened, about 1 minute. Turn off the heat; stir in the sesame oil, remaining teaspoon of oil and cilantro. Step 6Serve in a large bowl with a spoon, with the lettuce cups on the side. In Recipes-list.com we have selected the most viewed recipes from category - Appetizers Fish and shellfish . Enjoy the best recipes specially selected for you! 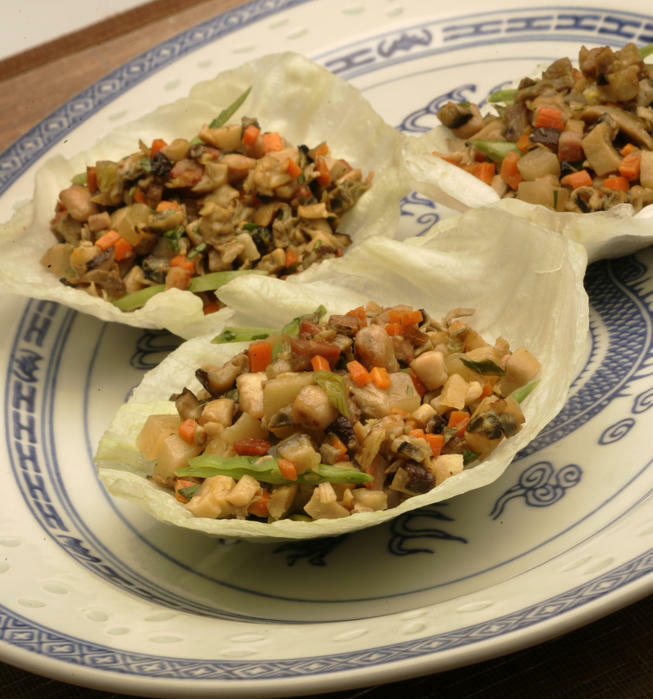 Dried oyster lettuce cups is the right choice that will satisfy all your claims.